Freshly roasted filter coffee is now available from Betsi & Co.
Betsi & Co was founded by Deb in 2012 after she struggled to find unique gifts and décor for their wedding, planned for the year later. For Deb, her business began online, selling handmade wedding favours on Etsy. Her passion and ideas, however, have since evolved. Betsi & Co now organise and run many home and gift markets across the county of Leicestershire. Deb wanted to offer something a little different at her markets. With this in mind, the ‘shop and sip’ pop up café was born. This unique feature co-insides with the already fabulous shopping experience perfectly. What can be better than a range of unique sellers alongside a pop-up café? Sounds awesome to us. To add to their already popular range of teas and tray bakes, Betsi & Co now serve freshly roasted filter coffee. Available in takeaway cups (so you can continue shopping!) this freshly roasted filter coffee is roasted by us, by hand, at our coffee roastery in Rutland. All of our speciality coffees are roasted with real passion, and this coffee is no exception. Currently, the freshly roasted filter coffee available at Betsi & Co’s pop up market is a Mexican coffee, roasted to keep its juicy, raisin-like sweetness. Other similar coffees will follow – allowing you to try different coffees as the harvesting seasons change. Betsi & Co will also be stocking the same coffee in 250g bags for you to enjoy at home. This is available in whole bean, allowing you to grind as you wish, to suit your favourite brewing method. So, if freshly roasted filter coffee AND a unique shopping experience sound just the ticket, follow Betsi & Co on social media, or visit betsiandco.com and see them at a village near you soon. 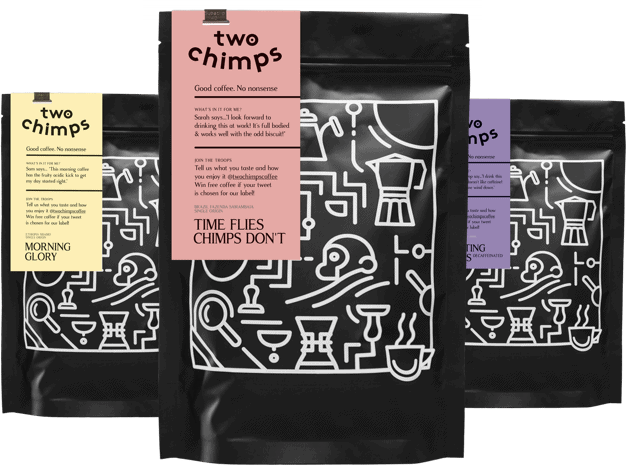 Want to know where else to try Two Chimps Coffee?